Photos: Submitted by Chris Goguen, Sandpiper #1104, click on the Pictures to Enlarge. 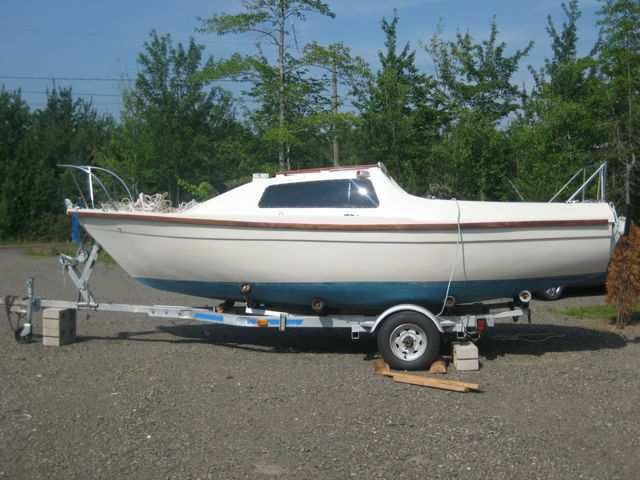 In 2009 I purchased my Sandpiper in Digby Nova Scotia and trailered it to "Cap de Cocagne" New-Brunswick, been fixing it up; new main sail, motor mount and rudder, sanded and refinished all the wood (it was all painted) 50 some hours of sanding and staining. Winter projects change the bearings in the keel and grease it, re-wire the entire boat, make some new locker covers out of wood, new coat of anti fouling paint for the bottom.